In “Setting Your Fitness Goals,” I mention that what you eat is 80 percent of your success rate for achieving and maintaining your fitness goal. So let’s start with the first meal of the day; breakfast. Many of us were raised by our parents to make certain we ate our breakfasts before dashing off to school. Unfortunately, today many of us claim not to have time for the early meal and instead either drink a cup of coffee on the go, snack at our desk while working, or hold off the pangs until lunchtime. Some even do so in the hopes it will ward off weight gain as their true motivator. Skipping breakfast is actually a more likely way to cause weight gain than weight loss. Studies have shown missing breakfast is strongly linked to the development of obesity as the morning meal skippers tend to eat more food than usual at the next meal or later in the day, and food that is less nutritional. Additionally, the daily prolonged fasting can increase your body’s insulin response, which in turn increases fat storage. So if you are a breakfast skipper, whether trying to save time or cut you calories, you may want to rethink your strategy. Breakfast is the most important meal of your day. Like starting your car in the morning, a healthy breakfast kick-starts your energy level, refuels your body, and replenishes the glycogen stores that supply blood sugar (glucose). Eating this morning meal within an hour of rising reduces your hunger later in the day, making it easier to avoid overeating, and increases your metabolic burning rate. What you choose to eat for breakfast also makes a big difference for your health. If you choose healthful, slow-burning foods, like whole grains and fruits, you should be able to control your appetite until midday and overeating is less likely. The more whole the grain is, the slower the digestion. This helps keep blood sugar levels stable, prevents energy crashes, and prevents from feeling hungry later in the morning or day. Oatmeal is a great source of slow-digesting, complex carbohydrates. It is high in both soluble and insoluble fiber, helping to reduce bad cholesterol by literally binding to them and sweeping them out of the body. 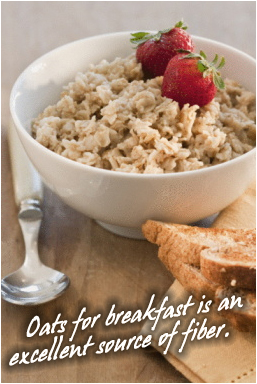 Oatmeal also contains a wide array of vitamins, minerals, and antioxidants and is a good source of protein and iron. In essence, oatmeal is a superfood. Oatmeal is also a powerhouse when it comes to helping prevent certain medical conditions. Numerous studies show that the fiber and other nutrients found in oatmeal may actually reduce the risk for certain cancers. Other studies have shown that eating oatmeal may help lower cholesterol, reduce the risk of heart disease, lessen the risk for type 2 diabetes, and may help lower high blood pressure. Egg White Oatmeal Pancakes: Grind 1 cup steel-cut oats and 1/4 cup chopped nuts (almonds and walnuts) in a food processor. Sprinkle in 1 teaspoon cinnamon. Add scoop vanilla whey protein powder (optional). Stir in 1 cup egg whites and blend. Lightly grease griddle with Pam. Heat griddle to 375 degrees F and until drops of water dance and evaporate immediately. Pour 1/4 cup of the mixture onto hot griddle and let cook until the edges start to look dry and bubbles form on the uncooked surface. Flip over and let the pancakes cook for another minute or two until golden brown. Top with fresh berries. 2 Servings. Fruit and Yogurt Parfaits: In a small bowl, combine 2 cups low fat vanilla yogurt and 1/4 teaspoon cinnamon. Combine 1 cup sliced strawberries, 1/2 cup blueberries and 1/2 cup raspberries in another bowl. In four clear, tall glasses, layer 1/4 cup fruit mixture, 2 tablespoons cooked oatmeal (or granola), and 1/4 cup yogurt mixture. Continue to build the parfaits, repeating the layers until all of the ingredients are used completely. Lightly sprinkle tops with wheat germ and top off with a few berries. 4 Servings.